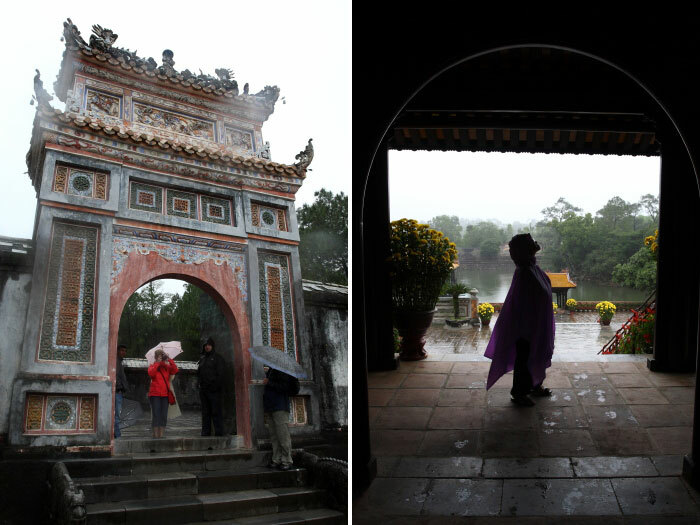 After visiting the ancient citadel and pagoda on the previous day, we were going to see all the imperial tombs in Hue. It was strange to me that the tombs were located in many different locations. Each of those had its own story and style, traced back to the way they lived their life in the past. In total, there were three imperial tombs we visited on that day. First, it’s the tomb of Tu Duc. He was an emperor ruling from 1848 – 1883, the longest reign ever in Nguyen Dynasty. There is a small lake with a tiny island in the middle. In the past, the emperor rowed a boat on that lake. It was shocking however that the body of the emperor was actually buried somewhere else in Hue. The tomb I visited that day was more like a memorial built for him. No one knows where his remain is. The two hundred labors who buried the body were beheaded in order to keep the secret safe. 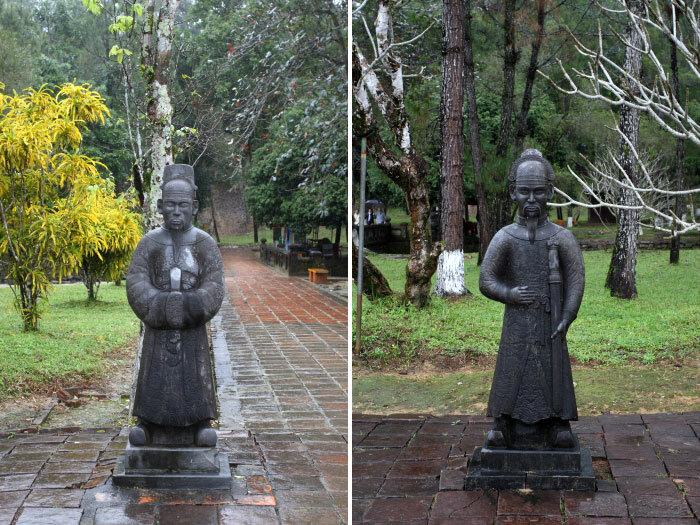 Next, we went to the tomb of Minh Mang, twelve kilometer away from Hue. To reach the place, we had to pass through a village of An Bang, sited on the bank of Perfume River, . 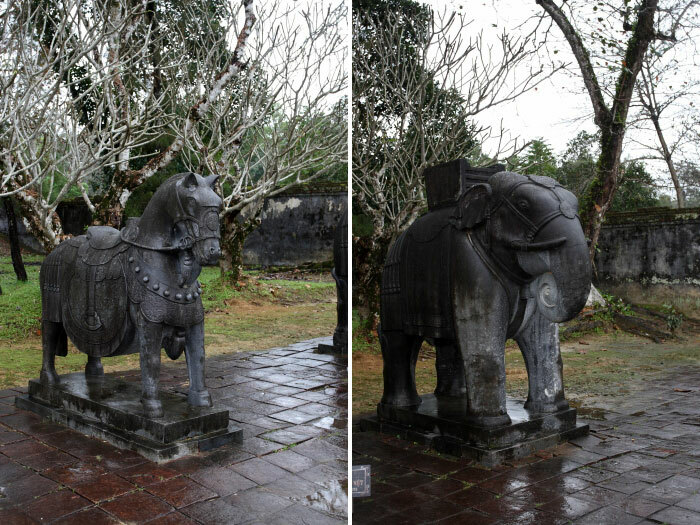 The site is smaller than the tomb of Tu Duc and surrounded with lush forest. Minh Mang was the second emperor of Nguyen Dynasty, reigning from 1820 to 1841. In 1825, the emperor banned French Catholic Missionaries from entering Vietnam. Within 1833 to 1838, he executed seven missionaries. To reach his tomb, I had to cross a stone bridge spanning over a crescent lake. The door to his tomb was locked. It is only opened once in a year on the anniversary of his death. The last tomb we came to was of Khai Dinh, the twelfth emperor of Nguyen Dynasty, reigning from 1916 to 1925. Not like Emperor Minh Mang who opposed the French colonialist, Khai Dinh was recognized as a collaborator with the French. 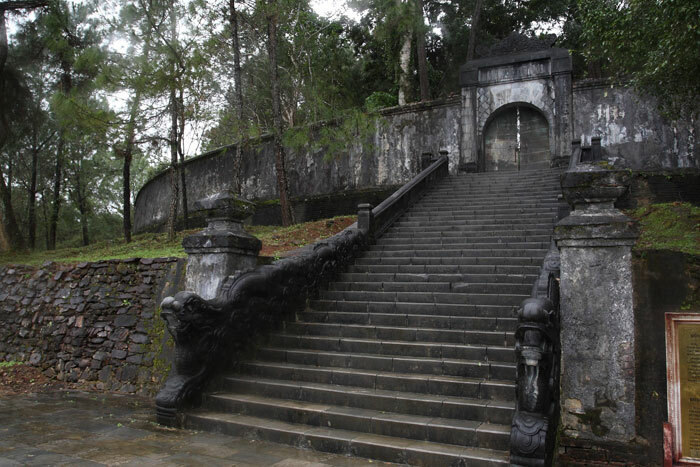 The tomb was located in the slope of Chau Chu mountain, about 10 kilometer from Hue. Of all the tombs I visited that day, it would be easy to say that this third tomb was different. I didn’t see much of oriental ornaments there. 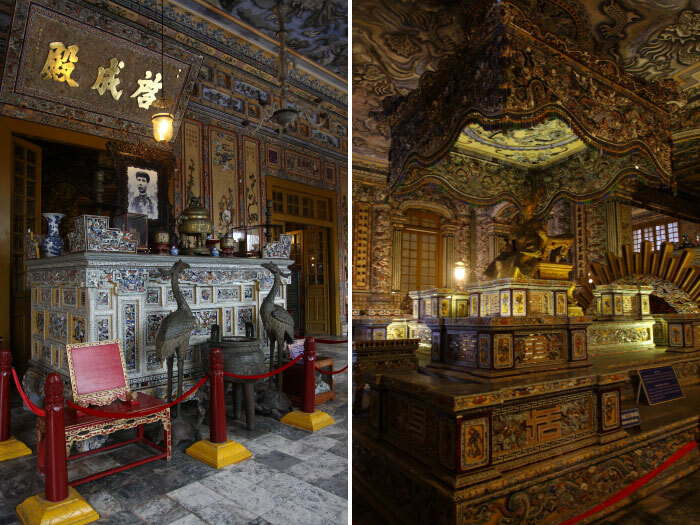 In fact, it looked more like a French mansion rather than a tomb of a Vietnamese emperor. Before returning to the hotel, we stopped by at another legacy of Emperor Khai Dinh. 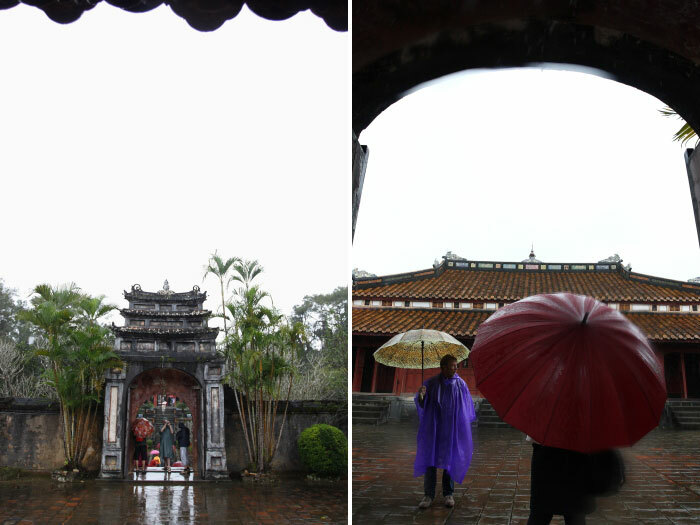 It was a grand mansion built in 1916 by the emperor for his son, Bao Dai, which became the last emperor of Vietnam. The mansion later became known as An Dinh Palace. Bao Dai abdicated in 1945 in favor of the Ho Chi Minh’s communist. The mansion was nearly destroyed in 1975 when it became the headquarter of Hue Labor Union. 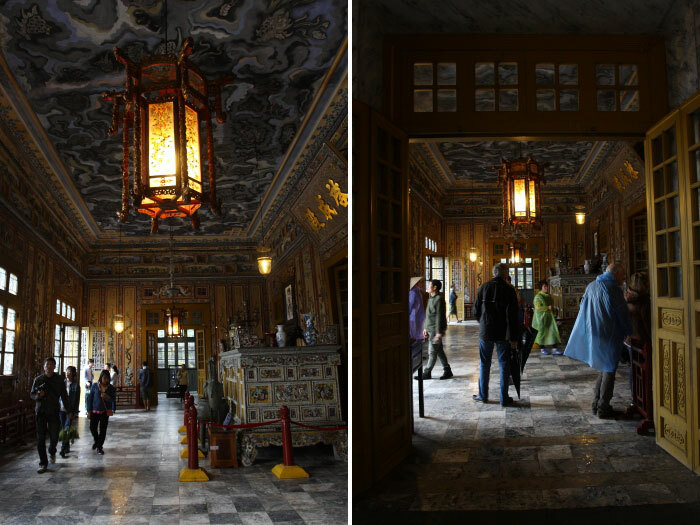 Thanks to German Conservation Restoration & Education Project (GCREP), the mansion was fully restored in 2002 and now becomes open for tourists. We were not allowed to take pictures inside, so it was only the exterior façade that I could capture with my camera. Spending two days in Hue, I could sense that this city had so many secrets. No one knows where the body of Emperor Tu Duc was actually buried, and it was rather hard to find the stories behind the An Dinh Palace. Hue keeps the mystery untold.